Let’s start with some background. How did the idea of the book come about and what was your process for writing it? And why Japan? Have you always wanted to be a published writer? Tell us something about your path to having your first novel published. Have you had other things published first? The path to publication doesn’t have an end point, I don’t think. There’s always something else you want to do or another point you want to reach. That could sound frustrating but it’s a good point, I think. Otherwise, you’ll just lose your drive and peter out. I’ve had a curious path, so far. I know, I know, two interviews in a month. But don’t worry, the sky’s not about to fall or anything. 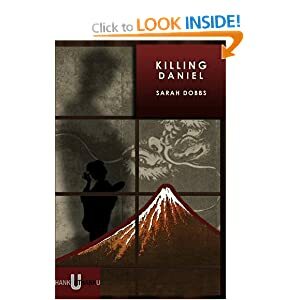 It’s just that this month has seen the launch of Killing Daniel, a rather fine book by a rather fine author, Sarah Dobbs. I don’t want to give too much away just yet, so maybe a review will have to wait for a while, but what I can say is that I can’t think of too many books that are set in Manchester and Japan, nor can I think of too many books that open with a murder so distinctively (and unsettlingly) described. Got your interest yet? Good. I can also add that this is far from vanilla crime fiction – it is contemporary, literary fiction, struck through with Sarah’s memorable descriptions and beguiling prose style. Pip: As an introduction, could you tell us a little bit about yourself? Sarah: I’m a writer – I think I’m just about allowed to say that without a little flutter of not-really-but-I’ll-pretend-until-it’s-true! My novel, Killing Daniel, was published by Unthank Books on 5 November. I also write short stories, some scripts. I also teach, paint, take photographs, stroke cats, lust after dogs, not in a weird way. Get drunk on two glasses of wine (as that poor lady I wobbled into at the recent launch might testify!) This be my public apology.